Many people instantly respond to the traditional Christmas Markets in Germany. They are very popular during the holiday season and visitors travel from all around the world to enjoy them. Many are not aware that Italy also hosts their own. 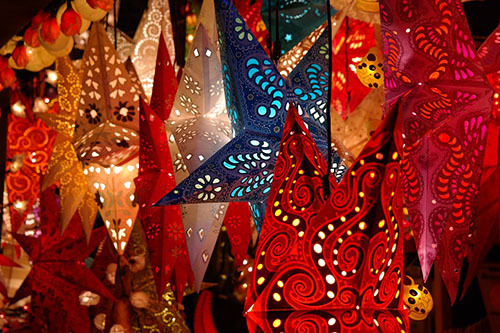 We would like to share five Italian Christmas Markets to consider. If you are looking for an extraordinary VIP experience and travel to Italy for Christmas, then you need to make your plans now! There are still great travel deals available on short notice. Fuoritinerario – Discover Your Italy is a boutique travel tour company that has a long history of of find off-the-beaten path opportunities. They have in depth knowledge of Italy and have offered to provide details on five Italian Christmas Markets. This medieval town is also known as Il Paese del Natale (the Christmas village). Its historic center becomes an enchanted place with the traditional sounds of bagpipes and handcrafted nativity on display all along the narrow alleys as well as in the Fregoso Fortress which dates back to 1000 AD. The market square hosts Santa’s home (reindeer included) and lots of fun activities for children organized by the elves! Candele a Candelara, the Candelara candle light festival, is the first Italian Christmas market dedicated to candles. Apropos, since the name of this medieval town is derived from the Latin word for candle. During the celebration all electric lights go dark at fifteen minute intervals and the town glows only with candle light. Visitors can also wander through the town’s traditional Christmas market. Certainly the most renowned town in Italy known for hosting the country’s largest Christmas market or mercatini di Natale. For more than a month, the magnificently festooned Piazza Walther is filled with decorated stands, as well as the fragrance of cinnamon and mulled wine – making visitors feel as if they are in a fairytale. The Marché Vert Noël (Green Christmas Market) turns Aosta‘s Piazza Caveri into an alpine Christmas wonderland with twinkling lights, glimmering decorations, and adorned Christmas trees. Shoppers can browse handmade items including candles, holiday decorations, soaps, ceramics, wooden handicrafts and antique furniture, as well as clothing and accessories made from local wool, felt, hemp and lace. This lovely seaside town of the Cinque Terre hosts one of the most beautiful and original nativity scenes in the world – The Presepe di Manarola – with over 15,000 solar-powered light bulbs and 300 characters made from recycled or unused materials. Visitors can walk through a candy cane village, and take cooking classes preparing traditional Christmas dishes. Discover Your Italy is owed by an Italian husband and wife team – Matteo Della Grazia and Daniela Mencarelli. Together they bring an enormous amount of travel knowledge and experience. Since 2007, they have become respected as experts in Italy travel. In addition to discovering the main attractions of Italy, get to know the cultural heart of this iconic country. The Life of Luxury is available to help plan and book your luxury travel vacation. From visiting Italian Christmas Markets to gazing at the pyramids of Egypt to a romantic Mediterranean cruise, let us help. Stop by again to read our luxury blog for the latest luxury travel news and hot destinations. Our travel concierge team is available to assist.